In an effort to get back to posting on a more regular schedule, I’ve decided to attempt a weekly post entitled, Grave Thursday. 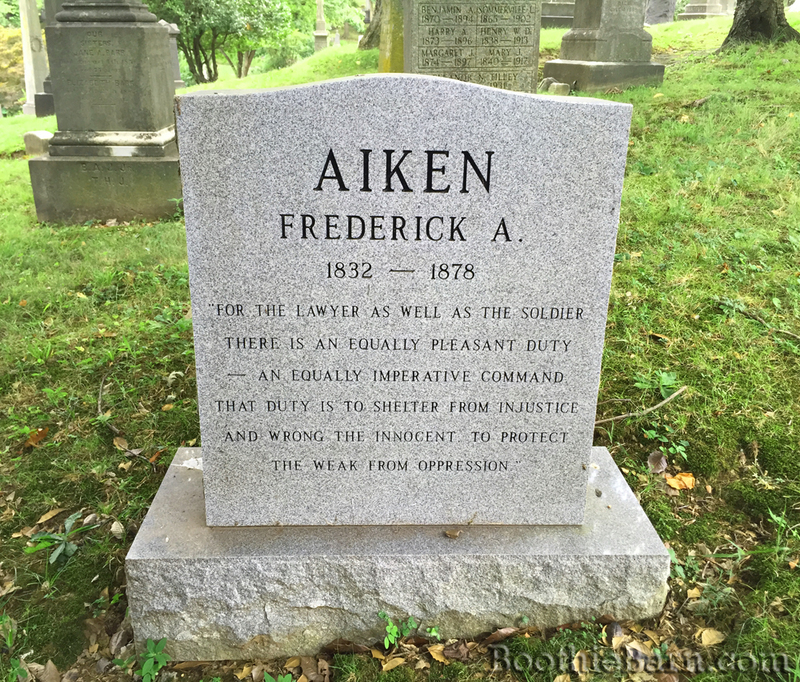 Each week I will highlight the final resting place of someone related to the Lincoln assassination story. It may be the grave of someone whose name looms large in assassination literature, like a conspirator, or the grave of one of the many minor characters who crossed paths with history. They won’t be lengthy posts, but they will be something to look forward to between my increasingly irregular research intensive pieces. On May 2, 1865, Col. Levi Axtell Dodd of the 211th Pennsylvania Volunteers was assigned duty under the command of Maj. Gen. John Hartranft. At that time, General Hartranft had been assigned as the commander of the Old Arsenal Penitentiary in Washington, D.C. and was charged with the imprisonment and care of the Lincoln assassination conspirators as they underwent trial. Col. Dodd joined Hartranft’s staff and would serve under him. Dodd’s major duties were to supervise the prisoners. Reports show that he supervised George Atzerodt as the latter bathed. After the day’s trial proceedings were over, Dodd would also stay in the court room with some of the prisoners when their lawyers wished to counsel with them. 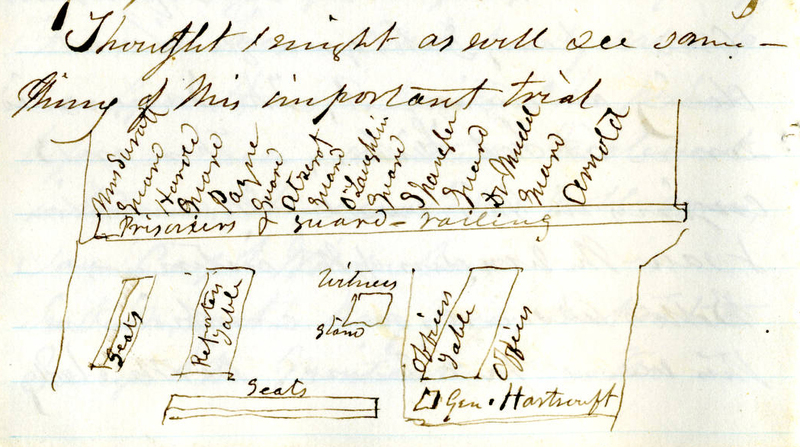 Dodd also supervised visits between the conspirators and their guests, sitting in on a meeting between Mary Surratt and her friend Mr. Kirby. After the execution of four of the conspirators, Dodd, who was subsequently brevetted as a brigadier general due to the recommendation of General Hartranft, was given the task of escorting the four remaining conspirators to their distant prison of Fort Jefferson off of the coast of Florida. This task he completed, earning the appreciation of Dr. Mudd who stated that Gen. Dodd allowed the lily iron handcuffs to be removed from the conspirators during part of the voyage. Dr. Mudd’s appreciation of Gen. Dodd would not last, however. Upon returning back from Fort Jefferson, Dodd, along with two others who accompanied the conspirators, would state that on the journey to the island prison Dr. Mudd confessed that he had known the identity of John Wilkes Booth the moment the assassin showed up at his door. According to Dodd and the others, Dr. Mudd lied about not knowing Booth due to his own fear of punishment. It is also interesting to note that Levi Dodd was born in Franklin, a small town in Venango County, Pennsylvania. In 1864, John Wilkes Booth traveled to Franklin and invested a great deal of his wealth in the oil fields nearby. Booth and some of his pals sunk quite a lot of money into a well in Franklin called the Wilhelmina, but the enterprise was a failure. 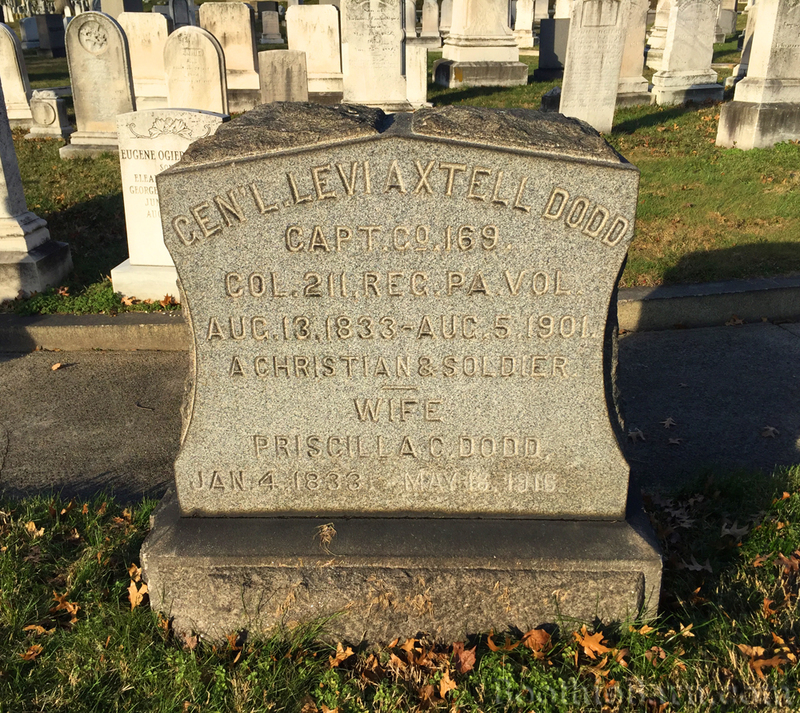 Gen. Dodd is buried in Green Mount Cemetery in Baltimore, the very same cemetery as John Wilkes Booth and many others connected to the assassination of Lincoln. Check out the Maps page for more details. In the “Weird Coincidence” file of Lincoln assassination trivia, we find this little gem. 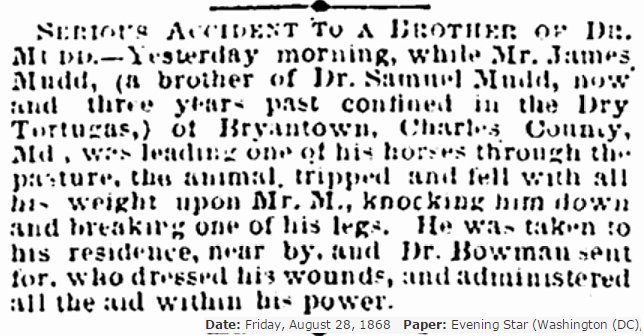 Since his brother was serving a life sentence at Fort Jefferson at the time for the assistance he gave to another man with a broken leg, James Mudd had to seek medical help from a different local doctor, Dr. William Boarman (misspelled as “Bowman” in the article). Posted on June 18, 2016 by Kate H.
Hello fellow researchers and connoisseurs of all things historical. Kate here, filling in for Dave who is currently online grave hunting. On June 16th, I gave a first person presentation on Mary Surratt for the Calvert County Historical Society in Prince Frederick, Maryland. Titled Beware the People Whistling, the presentation is a firsthand look at Mary Surratt, the only woman convicted of helping bring about the death of President Abraham Lincoln. As she languishes, locked away in Washington City’s Old Arsenal Penitentiary, contemplating her fate, Mary Surratt recalls memories of her family, the choices she made throughout the bloody American Civil War, and the man who brought her and her fellow prisoners to ruin, John Wilkes Booth. Beware the People Whistling is a play on the line “beware the people weeping” from Herman Melville’s “The Martyr,” a poem about the murder of President Abraham Lincoln. Throughout the poem, Melville stated that the convicted conspirators were to beware of the Union (the people weeping) since they would decide their fates. As the conspirators were imprisoned in the Old Arsenal Penitentiary, another man imprisoned there, Burton Harrison, recalled regularly hearing a melancholy whistle coming from the cell below his. That cell was occupied by conspirator Samuel Arnold. The title of this presentation, therefore, turns the poem on its head to imply that the people whistling (the imprisoned conspirators) had power too. In fact, the death of Mary Surratt turned the tables on the Union government, who suddenly found themselves attacked by newfound defenders of her innocence. Please note that this presentation is a historical fiction portrayal of Mary Surratt, not a completely accurate account of her time in prison. While working on my speech for the 2016 Surratt Conference, I studied Mrs. Surratt, her imprisonment, and eventual execution. That speech was a factual, in-depth analysis of the circumstances surrounding her sentencing. I then used what I learned researching that speech to create the framework for this dramatic portrayal. I condensed the timeline to fit everything I wanted to portray and most of all, I added material about Mary Surratt’s time in prison that may not be supported with facts. 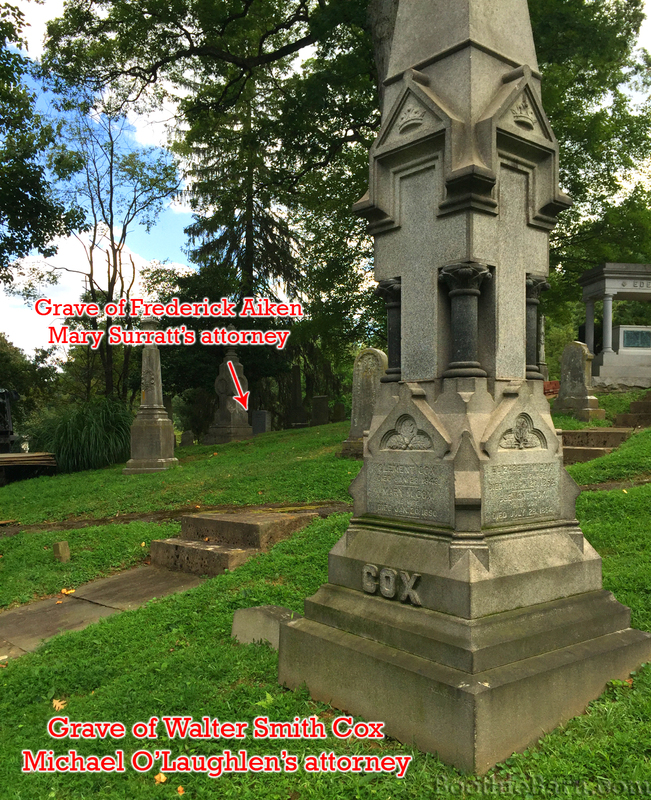 In short, I took some creative license in order to portray Mary Surratt the way I wanted to. Some of you may disagree with my sympathetic slant on Mary Surratt, and that is perfectly alright. In the end, this piece is more about trying to convey the thoughts and emotions of Mary Surratt, which we will never truly know. I hope you enjoy it. Located off of Dr. Samuel A. Mudd Road in Waldorf, Maryland is, appropriately, the Dr. Samuel A. Mudd House Museum. Situated on 197 acres of farmland, the museum tells the story of Dr. Mudd and his involvement with the tragedy of 1865. There are so many fascinating objects to see at the Mudd House. In fact, one could return time and time again and still find new items of captivating interest. The following are just a few of the countless treasures to be found at the Dr. Mudd House Museum. This volume of Beck’s Materia Medica (the text of which can be read online here) was owned by Dr. Mudd and was conceivably used by him while he was studying for his degree in medicine. Perhaps he also consulted this book from time to time during his practice. In addition to his name being written on the cover of the book, there is also an interior inscription of “Saml. A Mudd MD, Bryantown Char. Co., M.D.” While Dr. Mudd’s handwriting changed over time, the interior inscription does appear to match the handwriting on Dr. Mudd’s doctoral thesis, making it likely that he wrote the inscription himself. This book is sometimes seen laying out on the secretary in the doctor’s office or is otherwise shelved with some other medical books. In his occupation as a physician, Dr. Mudd owned and used this mortar and pestle to create medicines for his patients. It is on display in the doctor’s office. The practice of medicine was largely secondary to Dr. Mudd, who was first and foremost a plantation owner with a large farm. Dr. Mudd own several slaves who worked in his fields tending to his crops and in his home doing domestic chores. These clay jars, on display in the kitchen of the Mudd house, were made by some of the Mudd family slaves. Dr. Mudd could be a very harsh master at times and at the trial of the conspirators several of his former slaves testified against him. One of his former slaves, Elzee Eglen, recounted how Dr. Mudd had shot him for being “obstreperous” and then threatened to send him south to Richmond to build defenses for the Confederacy. Elzee escaped from slavery by running away from Dr. Mudd’s farm in 1863. On the other hand, a few of Dr. Mudd’s slaves testified in his favor and stated that he was a kind master. After Emancipation, three of Dr. Mudd’s slaves stayed with the family and continued to work for him for several years. We do know that Dr. Mudd participated in “slave catching posses” to recapture escaped slaves. At the very least, Dr. Mudd’s strong ties to slavery and the cause of the Confederacy dispels the concept that he was “a Union man,” as he tried to paint himself after being arrested. To learn more about those held in slavery by Dr. Mudd, I recommend the book, The Doctor’s Slaves by Robert K. Summers. The centerpiece of the Mudd House parlor is an antique settee. This small sofa is undoubtedly the most iconic item on display in the Dr. Mudd House and the most photographed piece in the museum. After the assassin of Abraham Lincoln and his accomplice arrived at the Mudd farm during the early morning hours of April 15, 1865, the injured assassin was brought inside and laid upon this couch. It was while here that Dr. Mudd first examined the leg of John Wilkes Booth. To subsequent generations of the Mudd family, this couch perfectly personified the desired mythology for Dr. Mudd. This settee was an innocent bystander, a piece that unknowingly gave comfort to an assassin. One can not place blame a sofa for being laid upon just as one cannot blame a doctor for fulfilling his Hippocratic Oath. However, while the sofa is free from any wrong doing, history has proven that Dr. Mudd had known Booth long before the assassination and likely provided assistance in Booth’s plot to abduct Abraham Lincoln. On the wall of the bedroom where John Wilkes Booth slept during most of the daytime hours of April 15, 1865, hangs a beautiful painting called, “The Sleeping Beauty.” This painting was painted by Sarah Frances Dyer, Dr. Mudd’s wife. She painted this portrait when she was in school and it demonstrates Mrs. Mudd’s creative talents. The following artifacts, on display at the Mudd house, are all items created by Dr. Mudd while he was in prison. Fort Jefferson is located approximately 67 miles west of Key West, Florida. This island prison was so isolated and the threat of survivable escape from it was so low that prisoners were allowed almost complete access to the entire island. As such, there were many chances for Dr. Mudd and the others to collect specimens from the tropical waters. Dr. Mudd made several canes and walking sticks while at Fort Jefferson but this one has the unique feature of being decorated with shark cartilage likely scavenged from the remains of a shark that had washed up on the Dry Tortugas. This cane is displayed on the bed in Dr. Mudd’s bedroom. Though a limited amount of flora grew on Fort Jefferson due to the lack of fresh water, Dr. Mudd still took the time to collect samples of flowers and leaves from the island’s vegetation. He put his specimens into this album, which appears to have been originally created to hold CDVs, common photographs of the day. This book is on display in a case in the second floor hallway. Dr. Mudd created this plain yet practical letter opener while at Fort Jefferson. It is displayed in the second floor case. Though fresh water was scarce, what was not lacking on the shores of Fort Jefferson’s beaches were shells. As such, Dr. Mudd took to collecting shells and affixing them to many different objects. This frame decorated by shells is in the second floor display case. The Dr. Mudd House displays two jewelry boxes built by Dr. Mudd which he ornately encrusted with a plethora of seashells. Another jewelry box created by Dr. Mudd appeared on Antiques Roadshow several years back. Jewelry boxes and cribbage boards appear to have been the most popular items to construct when spending time at Fort Jefferson. In 1867, Dr. Mudd’s fellow conspirator Edman Spangler sent a package of gifts to his former employer John T. Ford. The package contained several items to be distributed among the friends and families of Spangler, Dr. Mudd, Samuel Arnold, and Michael O’Laughlen. The items were four decorated boxes and six cribbage boards. So it appears that the conspirators had a veritable cribbage board factory at Fort Jefferson and honed their skills making them. This board, said to have been created by Dr. Mudd, is in the second floor display case. This checkerboard tabletop, created by Dr. Mudd, is affixed to a small table just inside the front door of the Dr. Samuel A. Mudd House Museum. It demonstrates Dr. Mudd’s increasing skill at inlay and marquetry. It is worth noting that lumber was fairly scarce on the islands of the Dry Tortugas. These pieces would have been made with either driftwood that washed up on the shore, or with surplus wood from the Fort’s carpentry shop where Dr. Mudd was sent to work alongside Edman Spangler. As Dr. Mudd’s time on Fort Jefferson increased, it appears he became more and more adept at woodworking and general carpentry. This game table shows great skill and is likely due to the teachings of his fellow inmate, Edman Spangler, who had been a carpenter by trade. Spangler helped construct the Booth family home of Tudor Hall many years before he was employed by John T. Ford to work as a carpenter and scene shifter in his theaters. It is likely that Spangler gave lessons in carpentry to his fellow prisoners and assisted Dr. Mudd in the creation of this table. It is on display next to the Booth sofa in the front parlor of the Mudd house. As we know, Dr. Mudd eventually secured a pardon from President Andrew Johnson due to his conduct during a Yellow Fever epidemic that swept Fort Jefferson in 1867. That epidemic took the life of Michael O’Laughlen, one of the other Lincoln conspirators. President Johnson pardoned Dr. Mudd shortly before the end of his term. He also pardoned the two remaining conspirators, Samuel Arnold and Edman Spangler. The men had bonded quite a bit due to their shared ordeal and circumstances. Though they parted ways, there was a reunion of sorts between Dr. Mudd and his teacher of carpentry, Edman Spangler. Spangler originally went back to work for John T. Ford in his theaters. John T. Ford always believed in his employee’s innocence and worked hard to get Spangler released. However, when Ford’s Holliday Street Theatre in Baltimore burned down in 1873, Spangler found himself out of a job. Spangler made his way to Dr. Mudd’s farm where he was welcomed in with open arms. Spangler lived with the Mudds for about 18 months doing carpentry, gardening, and other farm chores. Some of the artifacts on display at the Mudd house were owned or built by Edman Spangler. This wood plane, used in carpentry work to flatten and smooth a piece of wood, belonged to Edman Spangler and he likely used it while doing carpentry projects around the Mudd farm. It is usually regulated to a shelf in the doctor’s office but if you ask about it, and your docent is willing, he or she may take it out so that you can see the stamped ends that bear Spangler’s name. This dresser was made by Edman Spangler while he lived at the Mudd farm. Today, this piece furnishes the children’s bedroom, a fitting place due to Spangler’s affinity for children. In the second floor display case of the Mudd house is a 1861 copy of the New Testament which belonged to Edman Spangler. It was inscribed to him by Mrs. Ewing. At the trial of the conspirators, Edman Spangler was one of the last to find legal representation and it was essentially appointed to him by the court. His lawyer was General Thomas Ewing, Jr. Ewing had already been hired to defend Dr. Mudd and Samuel Arnold and was then asked to defend Spangler as well when the latter could not find any other representation. When Mrs. Ewing, the wife of Spangler’s lawyer, gave him this New Testament is unknown. However, whether he received it in the midst of the trial or at its conclusions when his fate was known, Spangler likely read thorough it for guidance and hope during the dark days at Fort Jefferson. It was found among his things when he died in the Mudd house on February 7, 1875. Edman Spangler died at the age of 49 while being cared for by his good friend, Dr. Mudd. Dr. Samuel Alexander Mudd died on January 10, 1883 at the age of 49. He was interred at St. Mary’s Catholic Church Cemetery where his parents were buried. Dr. Mudd’s wife, Sarah Frances, outlived her husband by 28 years before passing away in 1911. She was buried alongside her husband but for many years had no stone of her own. Around 1940, some of Dr. and Mrs. Mudd’s descendants decided to replace Dr. Mudd’s old headstone with a new one that would include both of their names. This was also deemed advantageous to do because there was a mistake on Dr. Mudd’s original tombstone that needed to be corrected. When the gravestone was replaced, Dr. Mudd’s old headstone was brought back to the farm. It was eventually placed in an old chicken coop located right behind the Mudd house. Look closely at the image below and see if you can find the mistake on Dr. Mudd’s original headstone. It is very fortunate that generations of the Mudd family came together in the 1970’s and embraced the house’s historical importance. They choose to restore the house to its 1865 appearance and open it as a museum. The earliest known photographs of the Mudd house, like this one from 1895, were consulted during the restoration in order to duplicate the exterior of the home as accurately as possible. Today, the restored Mudd house sits on almost the same amount of land it did in 1865, preserving the historic landscape that John Wilkes Booth and David Herold saw when they departed the home after receiving aid. Even ignoring the massive repository of items and artifacts relating to Dr. Mudd’s life and saga, the Mudd house is definitely a treasure all its own. Despite the numerous artifacts highlighted in this post, there is still so much to see at the Dr. Samuel A. Mudd House Museum. There’s Mrs. Mudd’s original cruet set, the Mudds’ original sideboard table, a large format photograph taken of Dr. Mudd at Fort Jefferson, a secretary built by Dr. Mudd while in prison, keys said to be from Dr. Mudd’s prison cell, a chair from Ford’s Theatre, and so much more. Just to see these artifacts in person is worth the $7 admission price. The Dr. Samuel A. Mudd House Museum closes down for the winter season so you have plenty of time to plan your future visit to this very worthwhile museum. Please visit DrMudd.org for more information. Aerial America is a stunningly beautiful television show on the Smithsonian Channel. The premise of the show is simple: use awe inspiring aerial photography to tell compelling stories of a state’s varied history. The series, which premiered in 2010, has featured each of the 50 states, the District of Columbia, and has also expanded into other destinations. The hour long episodes feature exquisite fly overs of historic sites and vistas, along with a compelling retelling of their significance. To see the episode images of Col. Samuel Cox’s home of Rich Hill, please visit the Friends of Rich Hill blog post entitled, Rich Hill on Aerial America. and please consider following the Friends of Rich Hill blog to stay up to date with our rehabilitation of the home. The episode also contained some generic shots of woods, swamps, and farms to represent other areas of the escape route but were clearly not the real places they were describing. Still, the five minute segment gave a wonderful look at part of the escape of John Wilkes Booth, from the unique aerial perspective. Kate and I are visiting my family here in Illinois and decided to use the opportunity to make use of the newly updated Lincoln assassination maps here on BoothieBarn. We planned and executed a two day excursion to visit some of the sites on the Lincoln Assassination in the Midwest map. The following is an overview of our trip composed using the tweets I sent out en route along with a couple of short videos I made. Kate & I are on a Boothie road trip in the Midwest using my Lincoln assassination maps: http://t.co/gcxlVGwWzV Updates to follow. Now that Kate is driving I can tweet. It's not even noon here in the Midwest and Kate & I have already been in Illinois, Iowa, and Missouri. After leaving Chicagoland, we headed straight to Keokuk, Iowa, a bit over 4 hours drive. There, we did what we do best, look for a grave. In the rain we trudged through Keokuk's Oakland Cemetery, looking for the grave of Mark Gray Lyons, who tried to shoot #EdwinBooth in 1879. From Keokuk, we then drove south about an hour to Quincy, IL to visit the Historical Society of Quincy and Adams County (@HSQAC). Our purpose for visiting the @HSQAC was to see their unique collection of relics concerning the imprisonment of the Lincoln conspirators. Once, the conspirators entered the courtroom hooded but the judges were very disturbed by this and ordered the hoods always removed before. Currently we're driving across Missouri, retracing, backwards, the train route #JohnWilkesBooth wanted to take when he was snowbound in '64. Kate's driving again so time for another update. We made it to Kansas successfully and our first stop was to see Art Loux. From Overland Park, KS we then drove three and a half hours to Aurora, KS just southeast of Concordia. Here we visited a hole in the ground. For now, Kate and I are heading back east to spend the night in Topeka, KS. Tomorrow we have a research appointment at the @kansashistory. On the second day of our Boothie road trip in the Midwest, Kate and I visited the Kansas State Historical Society (@kansashistory).
.@kansashistory's museum in Topeka is very large and does a wonderful job of teaching Kansas history and its ongoing impact on our nation. Kate and I had a research appointment this morning with @kansashistory in order to see some of their impressive assassination artifacts. But the big reason Kate and I made the trip to visit @kansashistory, relates to an event that happened two days and 150 years ago. After leaving @kansashistory, Kate and I started our trek home after making a short stop in St. Joseph, Missouri. It was a long haul through Missouri but Kate and I are in Illinois again about 2.5 hours from Chicagoland. 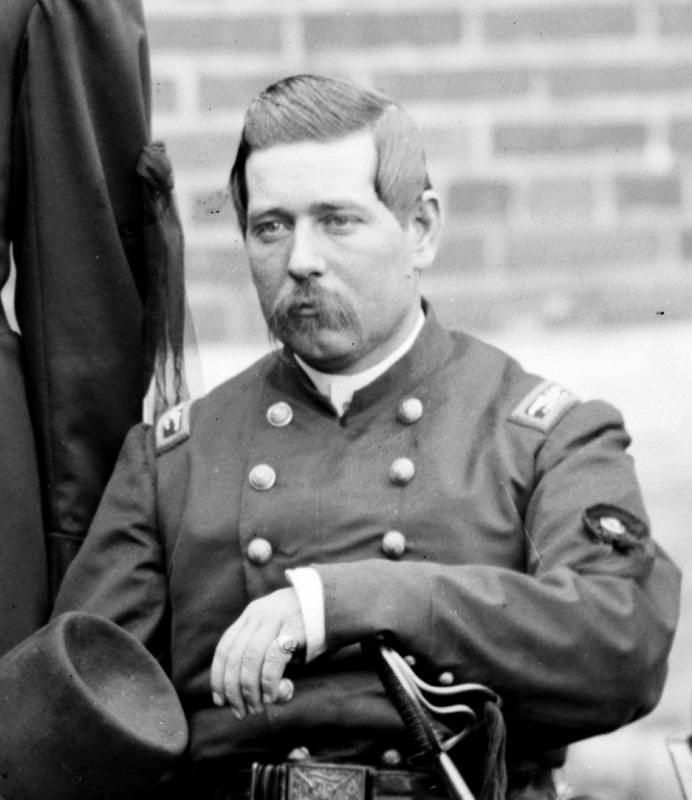 In 1865, Lieutenant Colonel Clendenin was selected to serve as one of the military commission members for the trial of the conspirators. So far, none of the commissioners I've visited (Lew Wallace, Albion Howe, Clendenin) signed #MarySurratt's clemency plea. 5 out of 9 did. While the trip mainly consisted of two long days of driving, Kate and I enjoyed ourselves and it was a lot of fun to see so many Lincoln assassination places, graves, and artifacts all at once. Thank you to the Historical Society of Quincy and Adams County, Mr. Blair Tarr, curator of the Kansas State Historical Society Museum, Nikaela Zimmerman, Barry Cauchon, and Steve Miller for all your help in making this trip possible. Also, thank you to my parents for letting me use (and put a considerable number of miles on) their car. Now you all get out there, take your own assassination vacation, and tell me about it in the comments below!